Egg-citing news, Disney fans! Those of you who have enjoyed the Egg-stravaganza each spring at Disney Parks will be glad to know that it will be returning to the Disneyland Resort, at Disneyland park and Disney California Adventure park, as well as the Downtown Disney District. This egg-ceptional event will, of course, also take place in Epcot at the Walt Disney World Resort! Here’s what you can egg-spect! From March 2–27, 2016 (or while supplies last), search for special hidden “eggs” themed to Disney characters and record your discoveries by placing the corresponding sticker on the specially themed Egg-stravaganza map to represent that location. Maps and stickers can be purchased for $5.95, plus tax at the following parks and locations. Remember, no discounts apply. Whether you choose to hunt for eggs or not, return your map to a redemption location: Elias & Co. at Disney California Adventure park; Disney Showcase in Disneyland park; World of Disney Store in the Downtown Disney District at the Disneyland Resort; or Port of Entry in Epcot before April 2 to pick up your surprise. Are you egg-cited to see what this year’s “surprise” collection of eggs will look like? Wait no more! Purchasing limits will apply, while supplies last. Keep in mind that no discounts apply and separate admission is required to enter Disney Theme Parks. The experience of course, is subject to restrictions and change without notice. I don’t know if anyone is still checking this blog, but I wanted to mention that the Egg-stravaganza has apparently been extended through Sunday, April 3rd — or while supplies last. This information was brought to my attention in the last couple of days (and later confirmed on the Disneyland Today Facebook page), but I wasn’t sure if Michelle would be able to come back here to update us. The Egg-stravaganza usually ends immediately after Easter, so this is, indeed, a delightful surprise! Adriana — As mentioned in some of the previous comments under this blog, the event is much longer this year — 26 days instead of the usual 10 days. There were, of course, more maps ordered because the event is lasting almost a full month. That said, there is no way to know when or if the maps will sell out. Doing the event on the last day is probably always going to be a bit of a gamble. Right now, most reports coming in from the parks indicate that there are plenty of maps and prizes to go around this year. But… there is no way to know how many people will do the hunt between now and the final day of the Egg-stravaganza, which is Easter. Also, one hunt may sell more maps than another hunt. 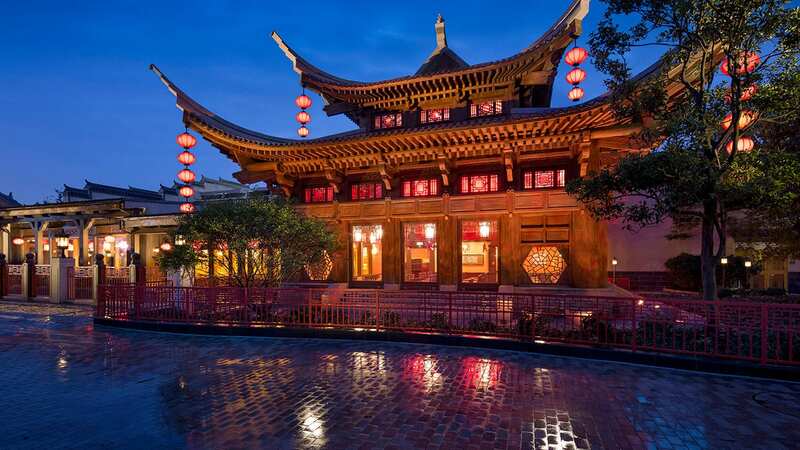 Downtown Disney is brand new to the fun this year, and it is accessible to non-park guests as well as park guests — which widens the fields of people who will buy maps. So it is always possible that the DTD maps could sell out. Or maybe not. There is really no way to know. My 6yr old son participated in this with me this last weekend at Disneyland. He really enjoyed the hunt and never tired of the excitement of finding each of the eggs. The only disappointment was the small empty plastic eggs given out for prizes. My child along with a few others I saw were understandably disappointed by this underwhelming prize. I think even something as modest as a few chocolate eggs inside would make a difference. Will Mr & Mrs Easter Bunny and Roger Rabbit be doing a Meet & Greet at Disneyland this year? If so, would it be Easter Sunday only? We’d like to bring our 3 month old son for his first photo w/ the Easter bunny but have been holding out on purchasing tickets and making travel arrangements until we have confirmation of the bunnies as that would be the sole purpose of the trip since he’s too little to enjoy the egg hunt, rides, etc. Do you know if Mr & Mrs Easter Bunny are typically in a parade on Easter? Or at a brunch? Any info you have is appreciated. So cool that they added a Downtown Disney Egg Hunt to the mix, it’s nice for the folks who aren’t passholders and can only afford to go so many times per year, kudos Disney. We’re fortunate enough to go once a week, but I’m happy Disney thought of non-premium AP families. This is a total blast, my 10 yr old son and I have done it since the start and look forward to it every Spring. We have every egg and cherish them for the memories of the experience. Plan on more than an hour per park to find all the eggs, I recommend you let your kids find each one and clue them in to the few that are harder to find (there are a couple each year they won’t see without help). Do both parks with a break in between if you have small children, you have to walk the entire park to find them all. We’re going today, see you there! The eggs look really nice. I have one question. Is there a Mr. Toad egg at Disney World? I saw a seller on Ebay who had a set of 7 eggs. They were all of the eggs shown above plus a Mr. Toad one. The Egg-stravaganza is fun for everyone. The eggs are very large and easy to find, so I think it is designed more for the youngest Disney fans to be able to spot them — but plenty of adults take on the Egg-stravaganza too. — There is only one prize/egg per map. — Michelle mentioned in one of her previous replies here that guests will be able to choose the prize/egg that they want this year (in the past that was not the case). — As far as I know, the selection of prizes/eggs is the same in each park (and probably in Downtown Disney too). Maybe that will be different this year, but we’ll soon find out! Is there only one map or a map for each place? Is it one egg per map? Do you get to choose which egg you’d like or is it a mystery? Are the prize eggs different in each location? I will be heading to the park tomorrow with my 2 girls, ages 3 and 7. If we purchase 1 map will we only get 1 egg? Not sure if this has been asked but how many maps can you purchase? Marisa — You can keep the map as a souvenir. You don’t even have to apply any stickers to it when you find eggs. You don’t even have to find any eggs. The map can stay totally intact and unadorned by stickers, or you can apply the stickers to it. Your choice. All you have to do is buy the map and show it to the Cast Member at the prize collection locations, and then you will claim your prize. I have a kind of odd question. I’m a sucker for souvenirs and I would love to keep the map for scrap booking, but I also want to get the surprise at the end. Is there anyway they could just mark my map to say I got the surprise and then I can keep the map? You’re too sweet. I appreciate it. Joanna — Roger Rabbit was one of the famous Disney rabbits who appeared at the Springtime Roundup in 2014 and 2015. The Easter Bunny was also at the Roundup. Many of the characters who greeted guests at the Roundup (including Mickey and Minnie in their spring pastels!) were there for quite a while last year (from late March into June, as I recall), and not just on Easter. Now that the Roundup is closed, the status of the spring-y characters has not yet been announced by Disney. I don’t know if there will be a new place for them to set up shop for greeting guests. My feeling — and it’s only a hunch — is that at least some of the Disney rabbits, including Roger, will appear somewhere in the park(s) for photos, but it’s anyone’s guess when and where they would begin to appear, and for how long. Juanita, I don’t know that they will have any place to offer that type of experience. But I do hope that you enjoy partaking in the Egg-stravaganza! I’ve had the same thoughts, Lynnae! I am not familiar with how the egg hunting is handled at Tokyo Disneyland, but I have always thought that it would be great to have a multi-level sort of hunt (at Disneyland Resort). Just like what you said, there could be something a bit more challenging for those who are up to it (maybe even using smaller, harder-to-find eggs? ), and then the regular hunt (which is the easy one). Although, I must say, even in the regular, fairly simple, egg hunt at DLR, there is usually a clue or two that ends up being more difficult than expected (sorry… eggs-pected! ), or even a bit misleading. I like those occasional, random, slightly-harder-to-find eggs too! This is egg-cellent news! I thoroughly enjoyed participating in the hunt in 2014, but unfortunately I was blocked out in 2015. I’m so glad to see that the dates have been extended this year! I also participated in the egg hunt at Tokyo Disneyland. If this event is a success, are there any plans of having an “easy” version for kids and a “difficult” version for adults (similar to Tokyo’s egg hunt)? The difficult version was great for adults or AP’s who already know every inch of the parks. Kristin — The maps are not available for purchase online (unless something changes this year). The only way you could get them prior to your arrival is if you have someone go to the park (on March 2nd or after) and get the map for you. Can the maps be purchased prior to our arrival ? We live out of state. Hey Kristin! Sorry for the delay. As Sherry mentioned above. The maps are only available at the Resort, there are no online options at this time. You buy the map at one of the locations that Michelle listed above in her blog. The map comes with character stickers. On the map will be clues, to guide you to the eggs. Many of the eggs are easy to spot even without maps, but you will need to buy a map in order to claim one of the prizes. As you find each egg hidden around the park (they are very large eggs), you will look for the corresponding sticker (which came with your map). So if you are, for example, hunting for a White Rabbit egg, then you will apply the corresponding White Rabbit sticker to the corresponding spot (where the clue is) on your map. The eggs you find stay put — you don’t take them with you. You don’t have to find all or any of the eggs in order to claim your prize, but you have to have the map to claim the prize. Sherry, thank you for jumping in with an explanation of how it works. You did an egg-cellent job of mapping it out for Mindy! I’m sorry that I don’t understand how this works. The last day of our trip will be the first day of the Egg-stravaganze. You get a map and fill it out? Or do you actually collect eggs? Could someone please explain it to me as my 4.5 year old would love this! Mindy, thanks for bearing with me. I think Sherry (above) actually provided you some great detail and insight. I hope it helped. Hello, my family and I are so excited for this. This will be the first time we are there at Easter time and we have heard the egg hunt is a blast. We will be there from March 22nd-March 25th. I noticed it said until supplies last. How likely do you think it is that they will run out? I don’t want to get my kids excited just for them to be disappointed. Also, do they get to choose which of the 6 eggs they would like as a prize? Finally, when do you think we will hear about any other Easter activities happening in Disney World? Thanks I know this is a lot of questions. Hi Michele! It is such a fun and egg-citing egg-sperience! Fans of all ages love it. This year the length of the egg hunt is longer than usual. Generally it’s around 10 days or so. I would hope that there would still be some on hand by the time you visit. 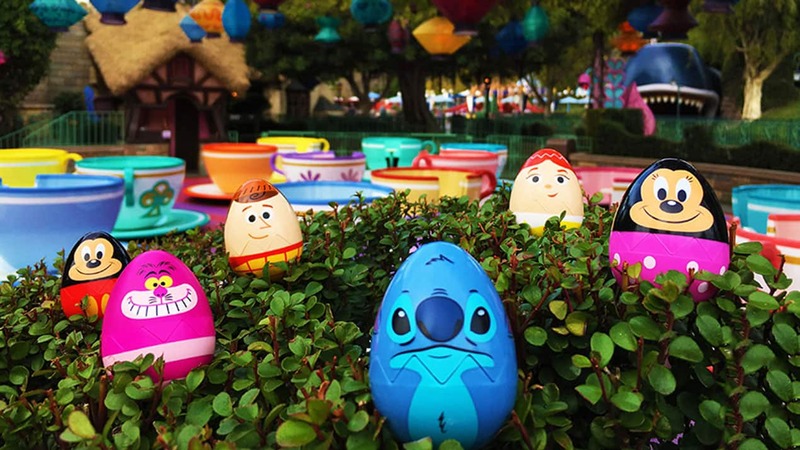 The egg hunt has gamed more and more popularity over the years and I think some of the ‘surprise’ eggs are certainly going to drive Guests in to participate. You do actually get to pick which egg you want, again, based on availability. In the past we have had an egg-scramble game, but this year, it will be a little easier, as we will let you choose the egg you want. As for any other details on other Easter activities, I haven’t heard, but if I do, I’ll certainly keep you posted. Nicole — I can answer that. Yes, indeed, the maps have sold out in the past, both last year and the year before. There isn’t a specific date by which they sell out — it probably differs each year, and maybe one year the Disneyland maps might sell out first, while the next year the California Adventure maps might sell out first. Keep in mind, though, that this is the first year the Egg-stravaganza is lasting for 26 days. In 2014 and 2015 it only lasted for 10 days, so there was undoubtedly a smaller supply of maps. I would certainly hope that more maps were ordered for a 26-day event — though they could still run out. Also, this is the first year Downtown Disney is involved in the egg hunting (with its own map). It will be more of a novelty since it is new. Since it will be open to anyone (unlike the hunts in the 2 parks, where guests have to actually be IN the parks to participate), my hunch is that the Downtown Disney maps could go very quickly. What some people do — let’s say if they are on a multi-day trip to the parks, or if they live locally and can return to the parks at a later date — is get their map first and then do the actual hunting later in their trip, or in a later week. Some folks have even been known to collect their prize immediately upon purchase of the map instead of waiting until after they have completed the hunt, as there were some issues with certain prizes in short supply too. Hi Michelle! I am excited but concerned because it says “while supplies last.” We won’t be there until the last 2 days, March 26 and March 27. Have they run out of supplies in the past? Hi Nicole! Indeed the maps have sold out in about a weeks time in years past. If it’s possible for you to participate any sooner, even in our Downtown Disney District area, I would. Hopefully we will have enough maps to go around for the entire time frame. But everyone does get pretty egg-cited about it, so they do go rather quickly. Yay!!!!!! We are so eggcited about this! My daughter and I have been visiting every year since she was 5 (she is now 14) during her spring break. We have never seen Eggstravaganza before! Always fun to do something different and I really appreciate that is has been eggstended to earlier in March. Shame on you Michelle for the spoiler: However, keep in mind, that the surprise at the end is actually one of the eggs featured above. As newbies, we had no clue what the surprise would be, but oh well, I guess the fact that it is an Easter egg should not come as too much of a surprise!!! Can’t wait. Just love Epcot this time of year. We are counting down till our March 12th travel date! Hope the maps do not run out. Ann, you are funny! Can you imagine if I didn’t tell everyone what they would be. Either way, you’re going to have a great time! With Easter falling earlier this year, I was hoping it would have been egg-stended a little longer – as in starting earlier! We will miss it by 3 days. We would LOVE to have participated! I’m sorry Candee! this is the longest the experience has actually run this year. But I will certainly pass your feedback on. One thing I forgot to mention in my above comment is that I notice that this year’s Egg-stravaganza is going to last for a longer period of time! In 2015 and in 2014, the egg hunts lasted for about 10 days. This year they are starting much sooner in March than I would have… wait for it… eggs-pected. 😉 I guess the Egg-stravaganza has been… here we go again… eggs-tended. 😉 This is eggs-cellent news! Okay, enough of the egg jokes — or should I say egg yolks?? 😉 I’m very happy this fun seasonal event is returning, and that Downtown Disney has been included. My only wish is that there were going to be some area for the wonderful egg decorators (who created the fantastic character eggs at the Springtime Roundup) to set up shop now that the Ranch and Roundup are gone forever. The egg art was a highlight of Springtime at Disneyland Resort. Stromboli’s is actually a location in Fantasyland at Disneyland Park. It’s just past the Dumbo the Flying Elephants attraction. Looks fun! Will the prize eggs be filled, or are they empty? The actual prize eggs are not filled. Are these eggs different from last year? Will DCA and DL have the same eggs? Hi Teri! Yes, these eggs are different than last year, including a different art style for the Mickey Mouse and Minnie Mouse eggs. YAY!!! I have been waiting weeks for this confirmation! My son and I have completed the 2 years in a row. I also love the new eggs this year! Thank you! SO excited for this and love the addition of DTD in there!!! I wish there were things like this all year long… it’s such a fun activity. Whoo hoo!!! Yay! I love the Egg-stravaganza! 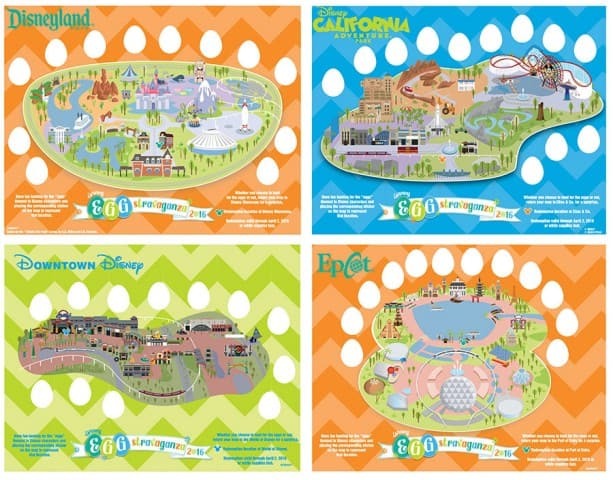 I’m excited to learn that Downtown Disney is being added into the eggy fun at the Disneyland Resort (along with the 2 parks, of course), because I am assuming that the Disney hotels will be included in that mix as well. I want to do all 3 of the hunts. Will Figment be included in the Epcot Egg-stravaganza again this year? Thanks!! Hi Stephen! Yes, once again you’ll be helping to look for a Figment inspired egg as you hunt for them. However, keep in mind, that the surprise at the end is actually one of the eggs featured above. 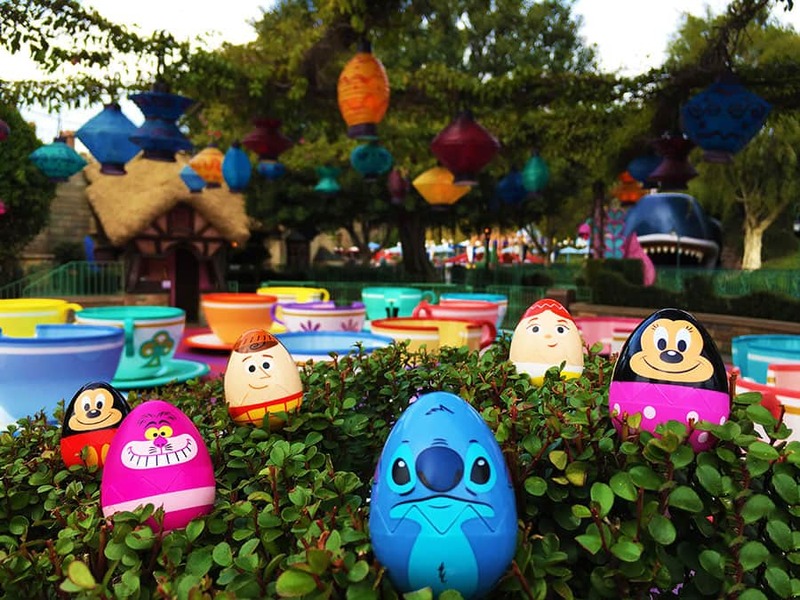 Do you know if the egg locations in the parks are different this year? Melissa, we’re egg-static to include the Downtown Disney District at the Disneyland Resort as well!